Well I thought that this post was missing, so that's the topic open to advertising Polaroid paper, tv ... etc.. So I open it with a photo by Orezemit, found on Polanoid, made in 1986 and apparently you can even get into it, crazy right? Orezemit a écrit : This is a copy of a faded 4x6 print that I took while in NYC for the Statue of Liberty Centennial celebration in 1986. 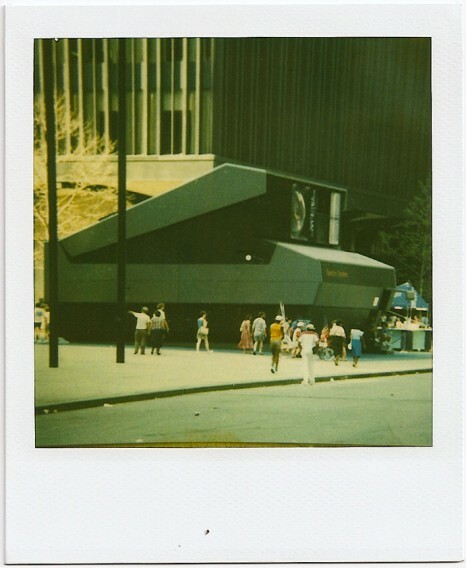 Polaroid unveiled the Spectra camera around that time and had this giant replica at the base of the WTC. You got to go inside and be dazzled by the inner workings of their new masterpiece. Normally I would not post a copy shot like this but since I only took one SX-70 camera with me on the trip and proceeded to drop in on day one...well, this'll have to do. I didn't want to post the original print so I made the copy with 600 film in a 690 slr. I thought some of you would like to see this relic. I'm sure it's history now. made in 1986 and apparently you can even get into it, crazy right? Oh, wow! I have lived about 30 minutes outside NYC all my life and I saw that with my father and my uncle on our way to the New York Automobile Expo at the Jacob Javits center. I was 10, maybe 11 years old and had my "the Button" SX-70 camera with me for the show, but had no film in it until we got there. My father didn't want me to "waste film taking pictures of another camera". He paid for the film when I was a kid, so he called the shots. Glad I get to see it again! Had I been allowed to take the picture, that may be what it would have looked like by now!